When the Oregon Department of Transportation replaced five aging bridges on Highway 38, it built community goodwill along the route by recruiting schoolchildren to build bat boxes and design bridge pylons illustrating local wildlife. The agency, which won a Highways for LIFE grant for the bridge project, used innovations such as accelerated construction techniques and design-build contracting to speed completion and reduce traveler impact. Its public involvement program was designed to draw community residents into the process and build support to keep construction moving forward smoothly. "When it comes to public projects, residents are the owners and it's important to recognize that," said Lois Cohen, president of Lois D. Cohen Associates, the Portland, Ore., firm leading the community involvement effort. "They're the ones who will live with the consequences of the project, for better or worse, long after the project team is gone." Involving schoolchildren was just part of the program, which also included open houses and meetings with government, civic and business leaders. Strong participation from contractors and Oregon DOT staff contributed to the program's success, she said. 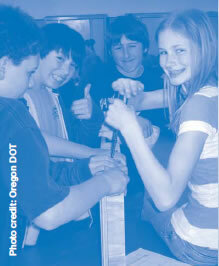 Reedsport middle school students built bat boxes to install under bridges in an Oregon DOT public involvement program. In Reedsport, at the western end of the project corridor, middle school students learned that bridges provide roosting sites for bats and built bat boxes for installation under four of the bridges. The project contractor cut wood for the students, who assembled the boxes with screws and signed them. "They were so proud to sign their boxes," said Cohen. In Drain, at the corridor's eastern end, elementary school students learned about the bridge-building process and constructed their own with gumdrops, toothpicks and saltines. Their creations were displayed at an open house next to the bridge project team's exhibits. "That increased open house attendance exponentially," said Cohen. "The parents and grandparents who came with their children realized that ODOT was trying to constructively engage and educate the community, not just tell them what was going to happen. It made it evident that ODOT is a great civic partner." In Elkton, in the middle of the corridor, high school students created designs to be carved on the pylons of a bridge over Elk Creek. The designs feature Douglas firs and grapevines to honor the town's logging and winemaking industries. They also highlight area wildlife, including the monarch butterfly, elk, osprey and salmon. "We encouraged students to get input from the elders of the community regarding what they think symbolizes Elkton," Cohen said. "At the school assembly to recognize the students who created the designs, the front row of bleachers was filled with community residents who were invested and engaged in the project." Elkton students also made a time capsule to embed in a pylon. Each grade, from prekindergarten to 12, chose items such as poems and CDs for the capsule. It will remain in the pylon until the bridge—expected to last 75 years—is replaced. 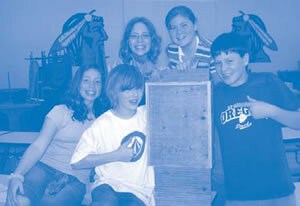 Photograph of Reedsport middle school students holding their finished bat boxes. Cohen developed a "Rapid Replacement" primer that explains accelerated bridge construction techniques, using the two Elk Creek tunnel bridges as examples. The new bridge superstructures were built away from traffic and slid into place, limiting traffic impact to a few days instead of the year or more required for traditional construction. The primer will be distributed to schools, libraries, community centers and civic organizations. For more information on the Oregon public involvement program, contact Lois Cohen at (503) 332-4869 or loisdcohen@comcast.net. To learn more about the bridge project, see the August/September Innovator at www.fhwa.dot.gov/innovation/innovator/issue08/. The results are in: A follow-up study on the Maine Highways for LIFE project to rebuild two bridges found that it met goals for safety, construction congestion and user satisfaction, although roughness and pavement noise dropped on only one bridge. Projects funded under Highways for LIFE must use performance goals to define project results while encouraging innovative solutions to construction challenges. The goals—covering safety, construction time and congestion, quality and user satisfaction—serve as a new business model for managing highway project delivery. A cost analysis found that using accelerated bridge construction techniques saved 15 percent on the reconstruction of Maine's Boom Birch Bridge. The Maine project involved reconstructing two structurally deficient, 1930s-era bridges: the Lamson Bridge near Addison and the Boom Birch Bridge near Old Town. Accelerated bridge construction techniques were used on both bridges, which feature a full system of prefabricated components. The Boom Birch Bridge is the state's first bridge with precast, post-tensioned pier caps. Construction involved full road closures of two-lane rural roads that required 14- to 16-mile (22.5- to 25.7-kilometer) detours. The goal was to minimize traffic disruption to residents and open the new bridges by the start of the 2007 school year. Safety: No worker injuries or motorist incidents occurred during construction. Since project completion, no highway user incidents have been reported. Congestion: Using cast-in-place construction for this type of project typically requires 24 to 36 weeks. The Boom Birch project was completed in six-and-a-half weeks, a 73 to 82 percent reduction. The Lamson project was completed in eight weeks—67 to 78 percent faster. User satisfaction: Results of a survey of Addison and Old Town agencies and residents indicated that all respondents were satisfied with the reconstructed bridges and roadways. Respondents were generally to very satisfied with the construction schedule, but some noted the added cost of the lengthy detours and the potential for increased emergency response time. To evaluate the projects' success in meeting quality goals, a laser profiler was used to determine the pavement's International Roughness Index and on-board sound intensity testing was used to measure tire-pavement noise. After construction, the Lamson project had a slightly higher noise level—a 1-decibel increase—and rougher pavement—an IRI of 389 inches per mile compared to 301 before construction—because of irregularities in the pavement approach to the bridge. On the Boom Birch project, the post-construction noise level was noticeably quieter—by 3.6 decibels—and the pavement was significantly smoother—an IRI of 137 inches per mile compared to 262 beforehand. The bridges' durability is expected to be superior to conventional cast-in-place construction because of the use of better-quality materials and controlled curing during the precasting process, resulting in less maintenance and lower life-cycle cost. Both projects met their accelerated construction schedules and opened to traffic before the school year began. The Maine Department of Transportation analyzed the cost of the Boom Birch project to determine the value of the innovations used. The agency estimated that traditional project delivery would have cost $370,000 more than the accelerated construction scenario. The full-lane closures and accompanying detours, by increasing vehicle operating costs and miles traveled, offset construction cost savings by $146,195. Net savings were $223,680, a 15 percent difference. In addition, the use of precast elements will likely increase durability and reduce the need for future repairs. For a copy of the report, Maine Demonstration Project: Reconstruction of the Lamson and Boom Birch Bridges, contact Mary Huie at (202) 366-3039 or mary.huie@dot.gov. 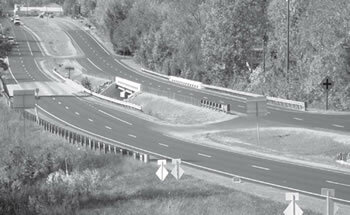 Look for articles on follow-up reports on other Highways for LIFE projects in future Innovator issues. An all-weather pavement marking system designed to make it easier for drivers to navigate work zones is ready for a tryout on real-life construction projects after researchers winnowed several candidates to one. Evaluation of the system, developed by 3M Co. of St. Paul, Minn., is one of five projects so far to win grants under the Technology Partnerships Program. The program, part of the Highways for LIFE initiative to promote highway industry innovation, provides funds to move innovations from promising prototypes to market-ready products. "The Technology Partnerships Program helps get new technologies to the marketplace faster so they can be put to use to benefit the driving public," said Technology Partnerships Program Coordinator Julie Zirlin. More grant recipients are expected to be announced in February 2009. The all-weather pavement marking system project is designed to refine and evaluate a system for work zones that is highly reflective in both dry and rainy conditions, making it more visible than conventional marking systems. That will make work zones safer for both travelers and construction workers. The system consists of high-build waterborne paint and glass beads, which provide good visibility in dry conditions but can be hard to see in the rain. It also includes optical elements made of a ceramic core surrounded by tiny, high-refractive-index beads. It's this second set of beads that provides visibility in wet conditions. Test participants driving through a simulated work zone on a closed course evaluated the visibility of pavement marking samples. 3M is using the Technology Partnerships grant to develop a version of the pavement marking system suitable for work zones. In the first round of tests, researchers formulated nearly two dozen samples by changing variables such as bead mixture, bead and element sizes, and paint thickness. They applied the samples to a test deck in New Orleans, LA. They measured the samples' retroreflectivity— or ability to reflect light back to the source—in dry, wet and rainy conditions at the beginning of the test and after exposure to the wear and tear of traffic. After analyzing the results, researchers picked three samples that retained the greatest degree of retroreflectivity to use in a human factors study developed and conducted by the Texas Transportation Institute. That experiment was designed to simulate nighttime driving in a work zone and assess the visibility of the prototype pavement markings under dry, wet and rainy conditions. The three prototypes—plus two conventional marking systems—were applied to a closed course that features a section where artificial rain can be generated. As study participants, accompanied by a researcher, drove through the course, they were asked to identify the earliest point at which they could detect a change in delineation in each marking. All three prototypes performed equivalently under all conditions and significantly outperformed the conventional markings under wet and rainy conditions. For the next round of tests on three work zones, researchers will use one of the thinner prototypes to promote faster dry-time and a high wet-reflective element drop rate for increased durability. Because frequent rain is critical to the success of data collection, two test sites will be in Washington state. The other will be in North Carolina. The goal is a cost-effective pavement marking system that maintains optimal visibility and enhances driver safety in all types of weather, as well as meets work zone requirements such as faster application and drying times. A paper on the experiment will be presented at the Transportation Research Board Annual Meeting in January 2009 in Washington, D.C., and published in Transportation Research Record: Journal of the Transportation Research Board. For more information on the Technology Partnerships Program, contact Julie Zirlin at (202) 366-9105 or Julie.Zirlin@dot.gov. To learn more about the all-weather pavement marking system, contact Fuat Aktan at (651) 733-5041 or faktan@mmm.com. The Florida Department of Transportation is developing a performance contract for hot-mix asphalt pavement, thanks in part to a Highways for LIFE workshop on using performance contracting for construction. A working group is developing the contract, which will get the agency away from prescriptive contract provisions and move it toward end result, or performance provisions. Already, three Florida DOT districts have identified pilot projects on which to use the contract, according to state officials. "Performance contracting goes to what we're trying to accomplish with Highways for LIFE, which is to build highways faster, safer, better and more cost-effectively," said Byron Lord, team leader for the Federal Highway Administration program. "With the classic construction method you tell the contractor exactly what methods and materials to use. But we're trying to develop a delivery method—performance contracting—that allows greater innovation, greater flexibility and greater creativity." At the August workshop in Florida, participants worked a training exercise to apply performance contracting methods to a project on Interstate 5 near Orlando. They ultimately determined the project was too large to use as a starter, so the state scaled back the size of initial projects targeted for performance contracting. About 20 people attended the workshop, including the state's chief engineer, materials engineer, bituminous engineer, construction engineer, several district construction engineers, and representatives from the Florida FHWA Division and Florida Contractors Association. The workshop allows states to view a project in light of performance contracting and work through exercises to understand "what needs to be thought through in order to succeed," said Lord. At the beginning of the workshop, participants bring up their questions and issues so that workshop leaders are sure to address them. Industry is concerned about whether performance contracting will treat contractors fairly, Lord said. And contracting agencies want to make sure that performance contracting provides the same quality level as the prescriptive process. To deal with those issues, the workshop works through the division of responsibility between the agency and the contractor, Lord said. If a contractor is not sure what a project will require, that contractor will build contingencies into the contract to cover the perceived risk. The workshop also addresses the issue of how performance or delivery will be measured. A key exercise helps the agency establish initial performance goals. "What do you expect of the contractor?" said Lord. "For example, what impact do you expect construction to have on traffic? What impact do you expect to have on safety? What are your measurements of quality?" Performance goals need to be concise, understandable and achievable, Lord emphasized. Once goals are established, they're tested against the acronym ISMART. "I" stands for the influence of the person or firm assigned the goal. Is that goal something the person assigned can influence? If only the DOT can influence that goal, then it's not fair to give it to a contractor, Lord said. "S" stands for specific. Are the goals well-defined? "M" stands for measurable, "A" stands for achievable, "R" stands for results-oriented, and "T" stands for timely. "Those are the tests for the goals," said Lord. Lord said it was wonderful to watch workshop participants learn how performance contracting can be a valuable tool. Sometimes there is resistance to a new concept like performance contracting, Lord said, but the workshops allow people to create their own vision of how performance contracting can benefit them. "We want people to have the experience of saying, ‘Oh, I see how that could work for us,’" said Lord. It is American industry's ability to harness its own creativity that makes it so productive, he said. FHWA is seeking additional state agencies interested in piloting performance contracting for construction. To learn more about becoming a pilot state, contact Mary Huie at (202) 366-3039 or mary.huie@dot.gov. The Buckland Bridge reconstruction was designed to minimize impact on the historic area. 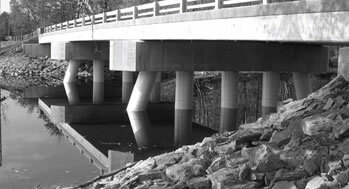 When a Virginia bridge rebuilt with innovative techniques was dedicated in October, stakeholders praised the project for its minimal impact on drivers and the surrounding historic district. The project to replace the deteriorated bridge, which carries Route 15/29 southbound over Broad Run at Buckland, used prefabricated elements constructed offsite and assembled onsite at night. That method enabled workers to finish the job in 12 nights rather than the 100 days needed for conventional construction. It also allowed both traffic lanes to stay open during peak traffic without construction of a temporary lane. Because of the innovative design and fast construction, the project had a minimal effect on the traveling public, Wally Covington of the Prince William County Board of Supervisors noted at the ribbon-cutting ceremony for the new bridge. About 25,000 drivers cross the bridge each day. The Virginia Department of Transportation's design also addressed the Buckland Preservation Society's desire to keep Route 15/29 a two-lane road to maintain the area's historical integrity. The bridge was widened toward the median rather than the outside edge to prevent extension of the bridge or roadway beyond the shoulder. "Thanks to VDOT's patience and diligence in working with various stakeholders, VDOT presented a resolution to a design dilemma that threatened to obliterate many remnants of Buckland's historic past," said David Blake, the society's president. "The memorandum of understanding signed between the Buckland Preservation Society and VDOT officials now stands as an example of the kind of agreement which can result from concerned parties in the community working together to find a solution for the common good." Area officials and representatives of the Virginia DOT and FHWA cut the ribbon at the Buckland Bridge dedication. A Highways for LIFE waive match helped finance the $2.8 million project, so what normally would have been Virginia's 20 percent share of the cost was covered by federal funds. The Federal Highway Administration program encourages states to use innovations that minimize construction time and congestion while boosting safety and customer satisfaction. For more information on the Virginia project, see the June/July 2008 Innovator. 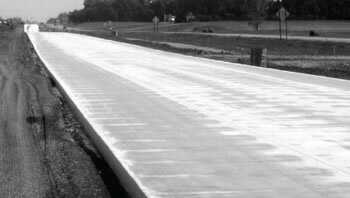 North Dakota's new concrete whitetopping uses the strength of the underlying asphalt base. Whitetopping—paving concrete over asphalt—is a proven and accepted technology in some states, but in others it's still considered quite innovative. The North Dakota Department of Transportation recently tried a concrete overlay when it repaved an 8.24-mile (13.2-kilometer) stretch of U.S. 2 between Berwick and Rugby. "This is our state's first whitetopping project of this scale," said Greg Semenko, assistant district engineer for the North Dakota DOT. "We've done a much smaller whitetopping project, but nothing this large. We've known about it, and we've designed this project to utilize the existing base of asphalt as best we can to maximize the strength of the concrete." For using the whitetopping innovation—and a full-lane closure—on the $6.8 million project, the North Dakota DOT won a $1 million Highways for LIFE grant from the Federal Highway Administration. 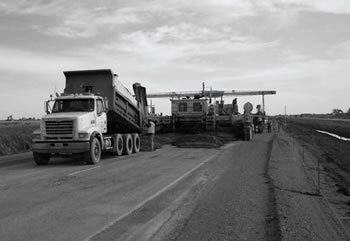 It improves the structural capacity of the roadway for a longer time than does an asphalt overlay. It can uniformly fill asphalt ruts and correct the road surface's profile. Because concrete has greater stiffness than asphalt, reflective cracking—cracks in existing pavement that come up through an overlay—does not occur. "We're looking for a design life of around 20 years or more," said Semenko. The North Dakota DOT is now developing specifications for whitetopping. Existing specifi cations from Colorado, Illinois, Iowa and Michigan are being used as examples, the state said in its application for a Highways for LIFE grant. The contractor placed the whitetopping with one pass of the concrete paver. Before the whitetopping project, the ride and distress ratings of the U.S. 2 Interregional Corridor were poor and maintenance costs had climbed. Distresses such as rutting, alligator cracking, and severe transverse and longitudinal cracking were present. The contractor, Progressive Contracting Inc. of St. Michael, Minn., began construction on the two-lane westbound side in May 2008. The side-slopes of the road needed to be widened and shaped to meet the DOT's safety standards, Semenko said. The next step was to mill the asphalt to level it up. "We milled off one inch [2.5 centimeters] at the edge of the pavement and just tickled it at the centerline," Semenko said. "We put in a 13-foot [3.9 meter] passing lane and a 14-foot [4.2 meter] driving lane. We're using a six-foot [1.8 meter] asphalt shoulder on the driving lane and a threefoot [0.9 meter] asphalt shoulder on the passing lane." In late October, the seven-inch-thick (17.8-centimeter-thick) concrete overlay had been placed and shoulder paving had just begun. In the new concrete, the contractor sawed three longitudinal joints, with cuts spaced across the two lanes. In other words, joints were cut between the wheel paths and down the centerline, and transverse joints were sawed at sevenfoot (2.1-meter) intervals. To build the project, the contractor closed off the westbound lanes entirely and ran traffic head-to-head on the eastbound side. That saved considerable time, Semenko said, compared to performing an asphalt overlay under traffic. The contractor took just eight days to do the concrete paving on the project. "If we would have put on seven inches of asphalt it would have taken 14 to 16 days," said Semenko. What's more, closing down the westbound side and rerouting traffic to the eastbound side improved safety for both the motoring public and construction workers, Semenko noted. The public did not have to travel through a work zone, and workers did not need to work adjacent to traffic. "We do a lot of full-lane closures, but typically if we paved this one with asphalt, we would do it under traffic," said Semenko. For more information, contact Mark Johnson in FHWA's North Dakota Division at (701) 250-4343 or marka.johnson@dot.gov.